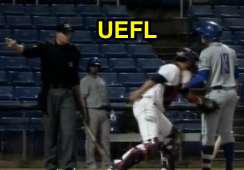 A Minor League Baseball batter strikes out after half-heartedly swinging at a pitch slowly rolling toward the foul line that he cannot reach from his position in the batter's box—is this the correct call? Umpire Sharshel rules Fuentes has struck out. The Play: With two out and none on in the top of the 8th inning of the Double-A Hartford-Binghamton game, Hartford batter Josh Fuentes stepped to the plate against Binghamton pitcher Cory Burns. With a 1-2 count, Burns lost his grip during his delivery and released his pitch, which slowly rolled to the first-base side of home plate. As the ball crossed the foul line—thus becoming a legal pitch—batter Fuentes pretended to swing at Burns' poor offering, ruled a swinging strike by HP Umpire Patrick Sharshel. After catcher Colton Plaia applied a tag on Fuentes (uncaught third strike), Sharshel declared the batter out and the inning over. Analysis: Let us begin by establishing the pitch's legality. Rule 6.02(b) Comment states, "A ball which slips out of a pitcher’s hand and crosses the foul line shall be called a ball; otherwise it will be called no pitch. This would be a balk with men on base." If we stop there, the proper call is "ball." But the batter swung...or did he? A STRIKE is a legal pitch when so called by the umpire, which—is struck at by the batter and is missed. Is this an attempt to strike the pitch? Thanks to Rule 6.02(b) Comment, we know that Burns' pitch is legal, and thanks to video replay, we know Fuentes missed connecting with it (by several feet). The only question is whether Fuentes' simulated swing satisfies the "is struck at" criterion. (Conversely, "A BALL is a pitch which does not enter the strike zone in flight and is not struck at by the batter"). Taking it a step further, the prevailing interpretation is whether or not "the batter struck at the ball." To further illustrate the principle that a swing is not the same as a strike, consider this: There is no doubt that Fuentes swung the bat—although it was lazy and half-hearted, Fuentes' action was absolutely a swing—but there is very much doubt as to whether Fuentes struck at the ball. In this context, to "strike" is to "to aim and usually deliver a blow, stroke, or thrust." Or "hit forcibly and deliberately with one's hand or a weapon or other implement." Or "to hit or attack someone or something forcefully or violently." This is not an ordinary half swing situation. The common theme between these three dictionary definitions of "to strike" is that it requires (1) A deliberate attempt to (2) Hit something with force. Fuentes' bat movement is deliberate: it's not an accident that the bat traveled the way it did—and in the direction of the awry pitch—but was this a strike "at the ball" and a bona fide attempt to apply force to it? If your answer is "yes," then that's a swinging strike. If "no," then that's not a swinging strike. the batter, but final decision is based on whether the batter actually struck at the ball." NCAA Rule: Though college actually defines the term "half swing" as "an attempt by the batter to stop the forward motion of the bat while swinging...[it is] a strike if the barrel head of the bat passes the batter's front hip" (2-39), that term does not apply here (there was no attempt to stop the forward motion of the bat). Thus, we consider the NCAA definition of strike: "A legal pitch struck at by the batter without the ball touching the bat" (7-4-a). Again, we have the subject (legal pitch) which is acted upon (struck at) by the batter. Thus, if the umpire rules there was no meaningful interaction between batter and pitched ball, there logically should be no swinging strike. What is notable about the NCAA book is Rule 7-4-h, which states, "A strike is awarded if the batter deliberately steps back in the box or swings in such a manner to attempt to create catcher’s interference." This is a tacit implication from NCAA that, yes, there exists a circumstance wherein a swing might not satisfy the 7-4-a "struck at" definition of Strike, and, thus, not be subject to being ruled a strike pursuant to the "struck at" standard. It appears the MiLB play might be one of those situations (albeit, without any attempt at CI). Wrap: Hartford Yard Goats vs Binghamton Rumble Ponies (Double-A) | Video via "Read More"